Three reasons to consider the Hermann Brain Dominance Instrument (HBDI) when planning your next event. 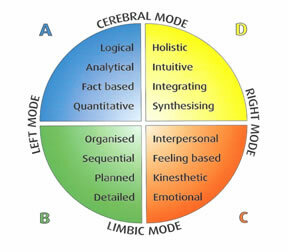 The Hermann Brain Dominance Instrument (or HBDI...or "Whole Brain" model) is one of the most highly researched brain models out there; showing how different people have a tendency to view various situations differently, respond to different stimuli, and even gravitate toward different professions. Those in the "A" quadrant tend to be the Analyzers of the group. The Analyzers are highly logical and quantitative. These would be your CFOs, perhaps even some accountants, etc. For them, the most persuasive argument for adopting a new process is to lay out the numbers. What will it mean to the bottom line? 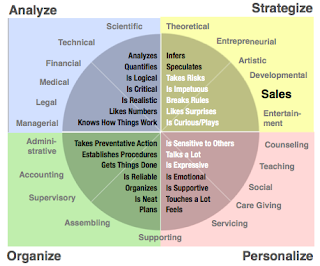 Those in the "B" quadrant are your Organizers. The Organizers respond to order and detail. These are likely your meeting planners. Theyʼre highly efficient and good at making sure that everything falls into place. As long as things are checked off the list in a timely manner, theyʼre with you. 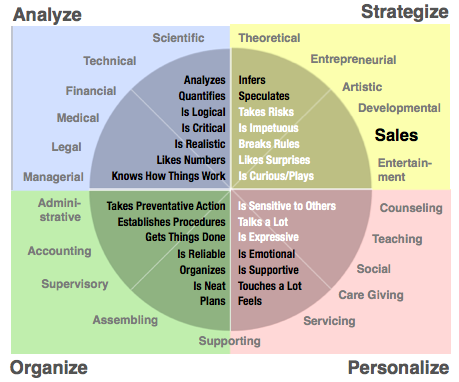 Those in the "C" quadrant are your Personalizers. The Personalizers in an organization are often the human resources personnel. These are also the teachers, the social workers, etc. They are very concerned about how people are going to feel about information and are persuaded by a collectivist good. And finally, those in the "D" quadrant? Those are your Strategizers. The Strategizers are your sales people. It doesnʼt matter much if information is perfectly laid out. It doesnʼt always have to be super logical or in detailed steps. What matters is that the information/process/etc. makes sense and is relevant to them. With this in mind, what are three things you should consider with regard to the HBDI and your next event? The makeup of our profession correlates with, at least somewhat, the makeup of our brain and how we are persuaded. If your audience is full of sales reps, they're going to fall into a different quadrant--generally speaking--than, say, human resource directors. Paying attention to who is in your audience can give you clues on HOW to present your key messaging. Data isn't always bad. Playing to the emotion of the story isn't always right (though engagement IS absolutely critical). Not every audience is the same, so your solutions shouldn't be the same. You're having a sales meeting. To convince your sales force that you're going to have a great year, you throw data at them. The collective eyes glaze over and the messaging is lost. You're having a meeting of CFOs. To convince the CFOs that you're going to have a great year, you throw data at them. They are enthusiastic. When you think about the whole brain, you think about the whole audience. It's unlikely that your audience will be *only* in one quadrant. Crafting a multi-faceted presentation with persuasion coming from multiple angles (i.e. data, story, interaction, WIIFM) will reach the whole audience and the whole brain. There's a challenge that comes into all this: the designers of a meeting are typically not in the quadrant that their audience resides. The CFO giving a presentation for a human resources department is unlikely to persuade them. Therefore you can have a meeting planner--concerned with all the points fitting into their proper place--having a meeting for a sales force that craves interaction, engagement and a clear, concise message.